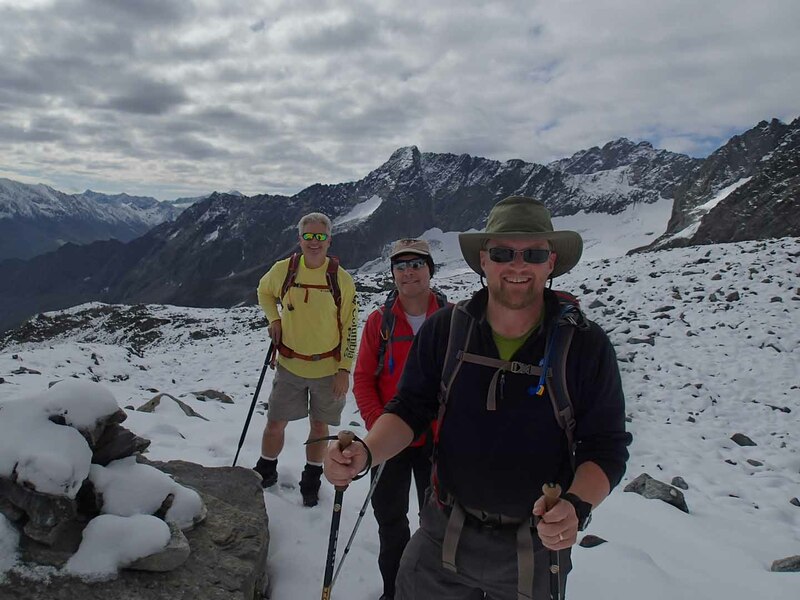 I very recently had the opportunity to travel with good friends to spend a week hut to hut hiking in Pitztal, Austria. After the hiking tour, I stayed in Germany an extra week to visit family. 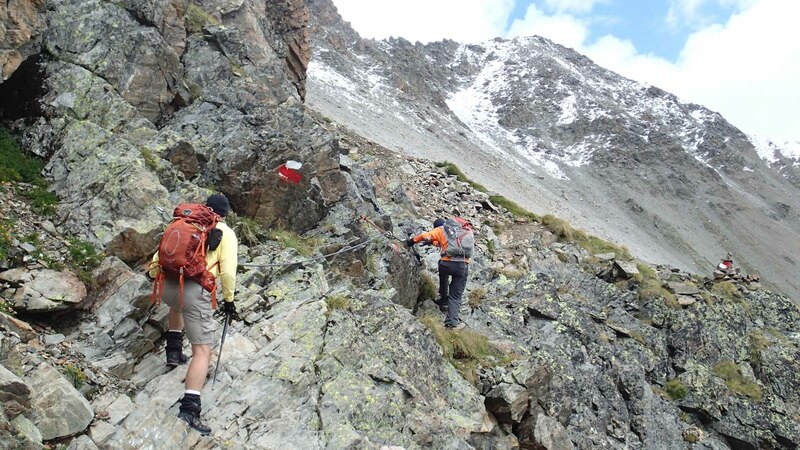 So, what the heck is hut to hut hiking? 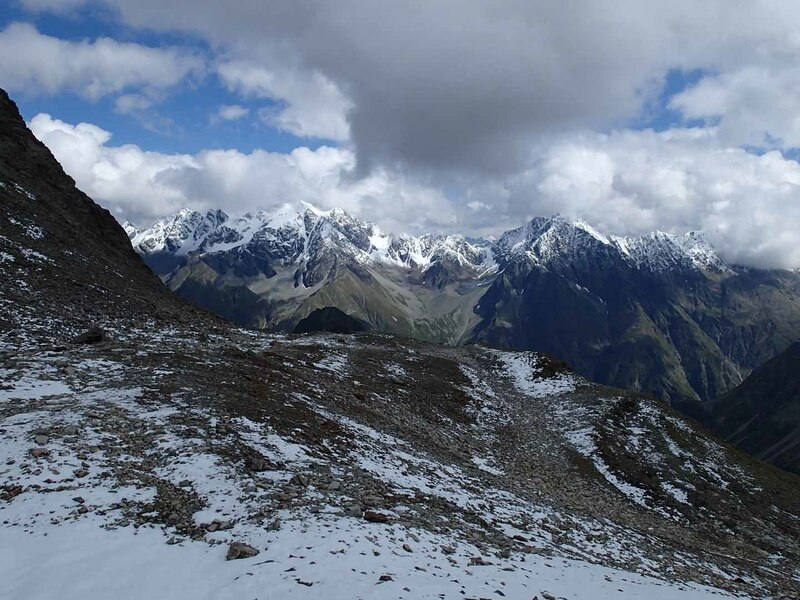 And where on earth is Austria and this place called Pitztal? I suppose it’s unfortunate that the English translation for Hütte is “Hut.” Hut connotes, well, something entirely primitive. Something one would strive to avoid. 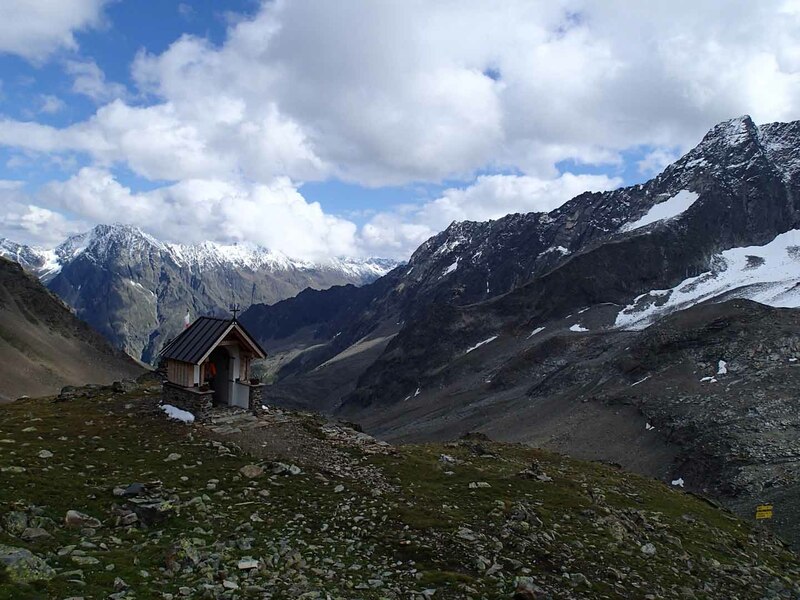 In fact, the huts situated throughout the Alps offer comfortable, clean accommodations, with food, drink, bedding and hot water. Some, in Switzerland, rise to the level of four-star hotels. 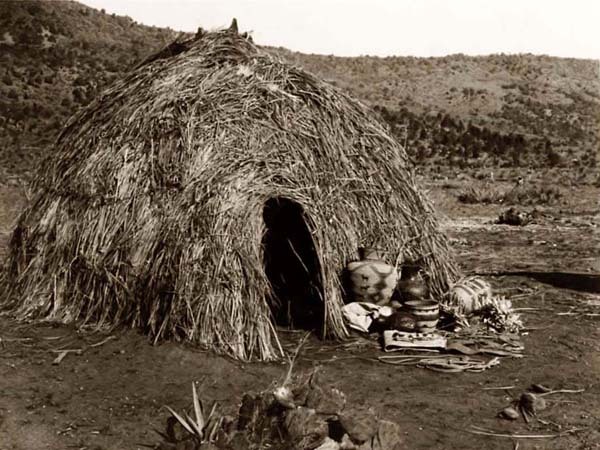 The benefits of hut to hut hiking are many. First, you need to carry only essential gear and clothing in a relatively small, light 40-60 liter backpack. No need for a tent, sleeping bag, stove, or food. 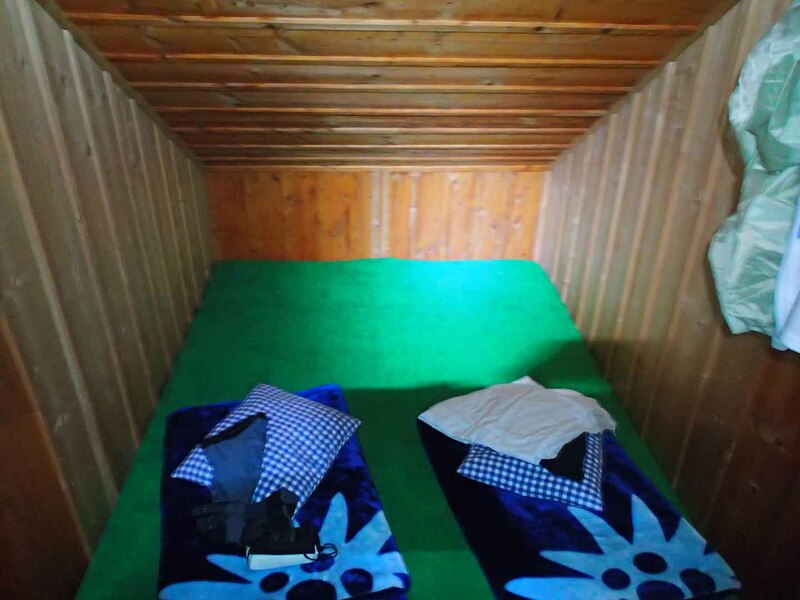 Second, by staying in the huts, you are able to generally stay up above the treeline and spend more time enjoying the alpine scenery. Also, the huts and their proprietors offer good food, warmth and Gemütlichkeit. Enjoying our time at the Kaunergrathütte. So, shed no tears for us having to “suffer” on our vacation. 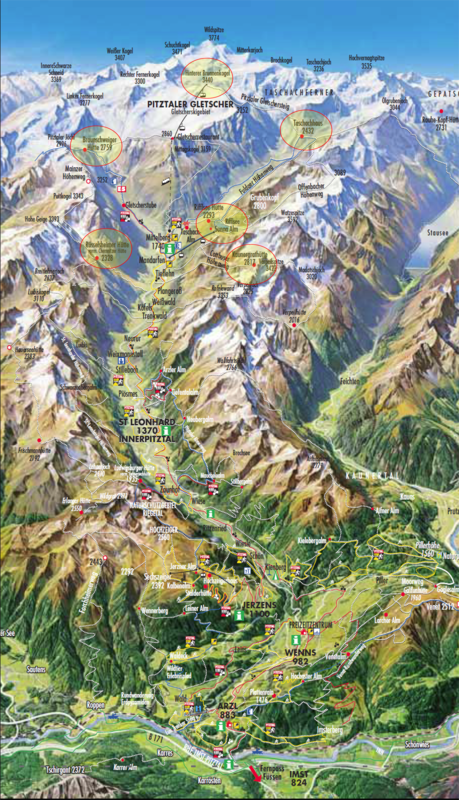 And where, exactly, is Pitztal? 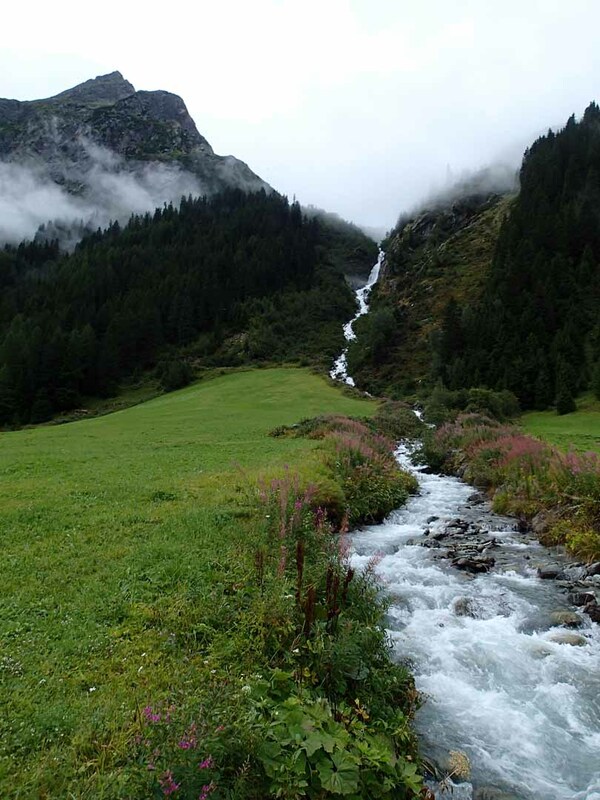 Pitztal, (the “Pitz Valley”) lies in the Federal State of Tirol, in western Austria, west of Innsbruck. If you do go, that’s fine. Enjoy. Just don’t ruin it. On August 22, 2013, we flew out of Atlanta direct to Frankfurt, Germany. 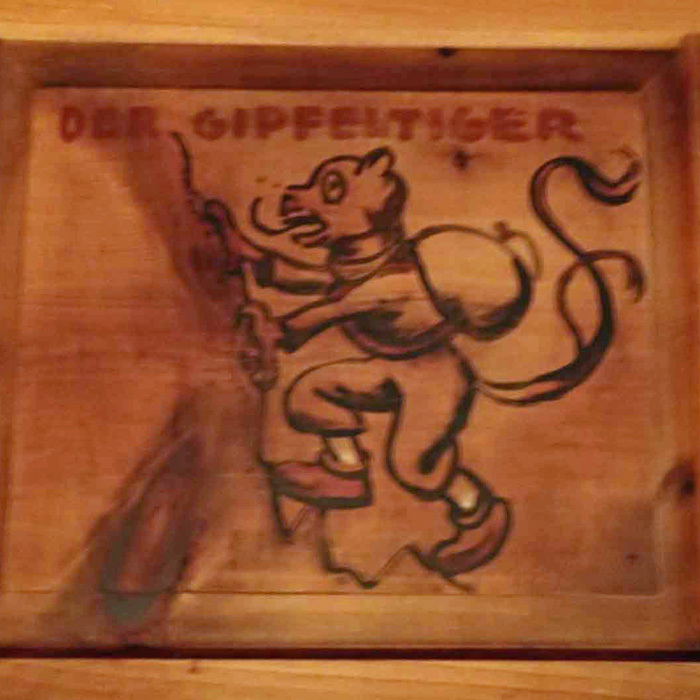 The next morning, we arrived and drove from Frankfurt to Landstuhl to pick up the fourth member of our party, Gerd. 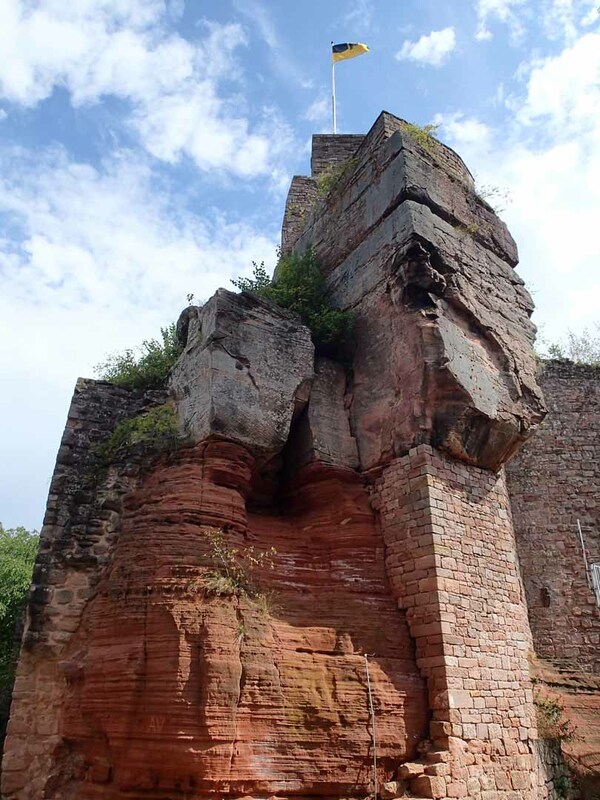 While in Landstuhl, we walked through the town and up the hill to tour the Burg Nanstein. 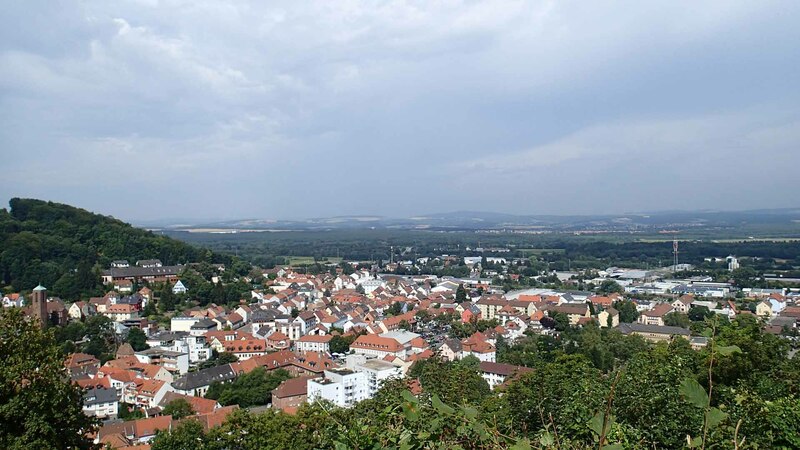 Landstuhl is a wonderful town located in the Rhineland-Pfalz. 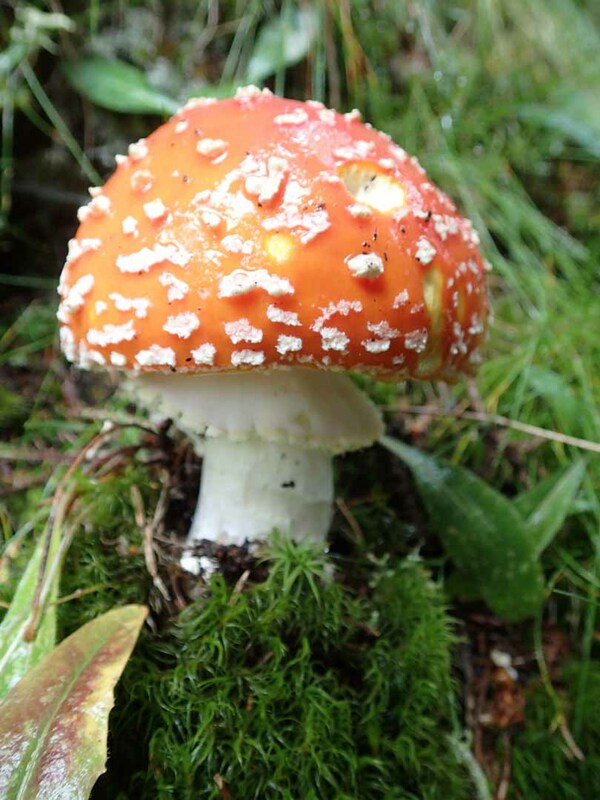 It backs up to the Pfälzerwald, a natural park of rolling hills and forests. Lots of great walking opportunities. I know the town and it’s environs quite well. I spent many summers there, in my youth. 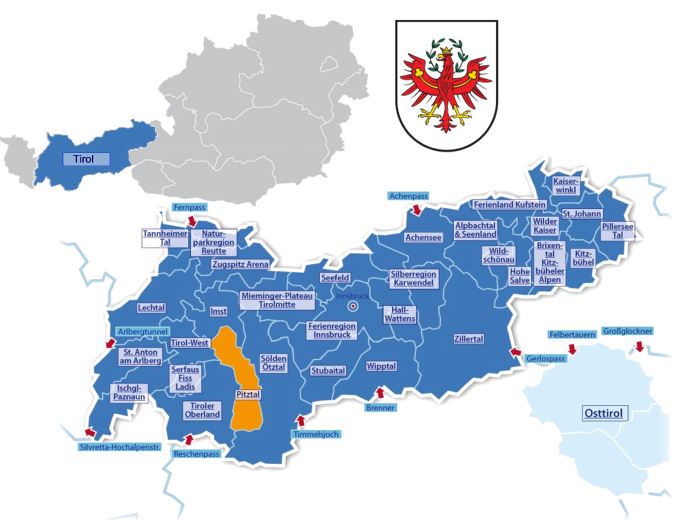 My mother is from Landstuhl. Afterwards, we stopped at my cousin’s house to enjoy a wonderful welcome party and finalize the next day’s departure plans for Austria. While in Landstuhl, we stayed at the Air-Hotel Royal. I recommend it. Heading out. Ignorance is bliss. From Landstuhl, we drove to Piller, Austria at the beginning of Pitztal. 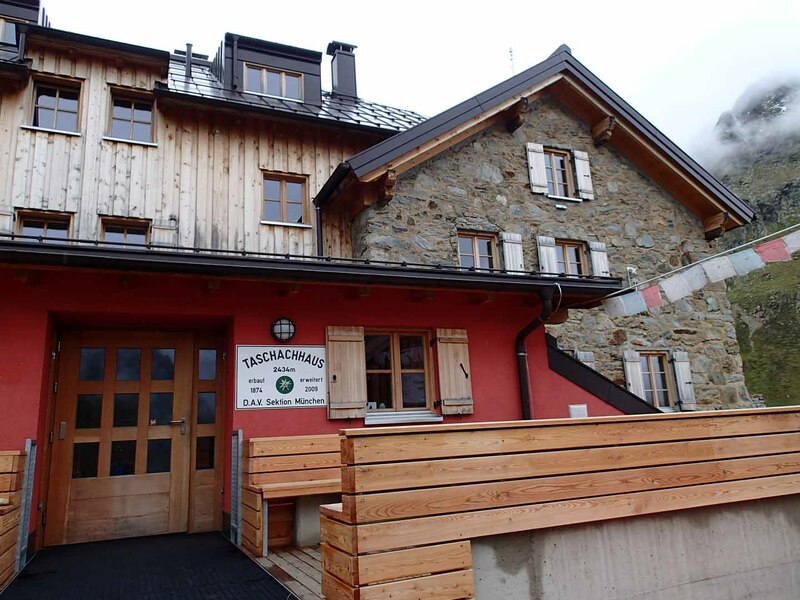 We spend the night at Gasthof Hirschen, hoping that it would stop raining. Day 1: The next morning we awoke to rain and saw new snow on the distant mountain peaks. 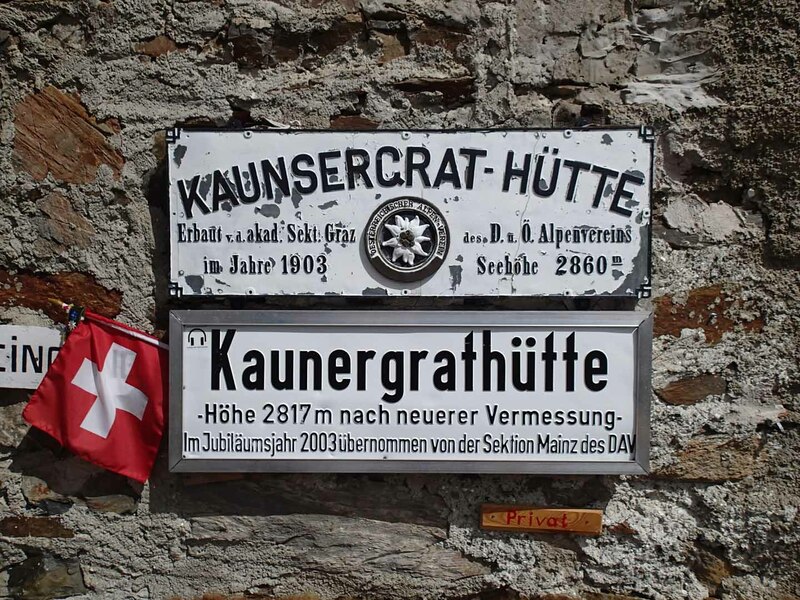 A call to our intended destination, Kaunergrathütte, confirmed what we suspected. 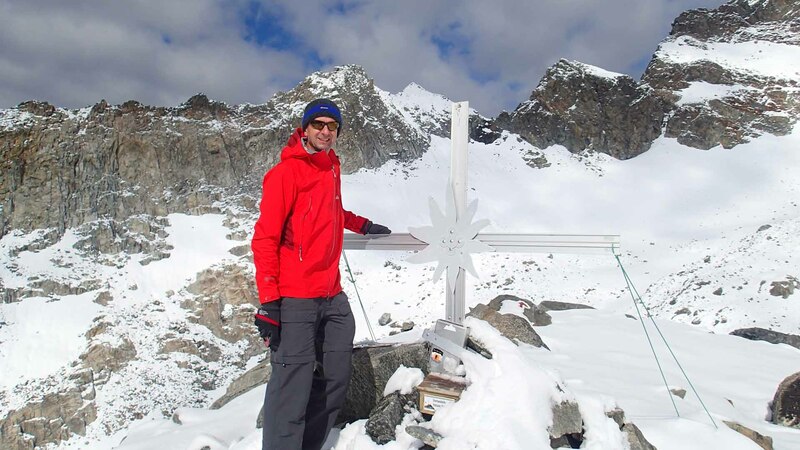 There was new snow up at the hut and it was recommended we not attempt the hike. In the mountains, the best laid plans are always subject to the weather. But having a detailed itinerary provided us the necessary information at our fingertips to modify and reschedule our plans to accommodate the realities brought upon us by the weather. We opted, instead, to hike up the adjacent ridge from the hamlet of Plangeroß to the lower-lying Rüsselsheimer Hütte (2,323 m : 7,621’). 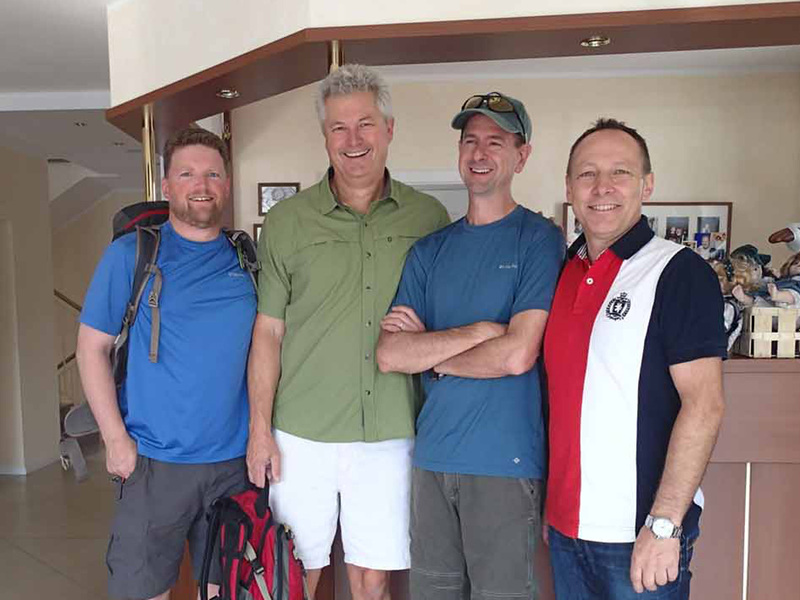 It turned out to be kismet, because the demands of the originally intended hike–even in ideal weather–would have been too harsh for our un-acclimatized group. In Plangeroß, beginning our trek up to the Rüsselsheimer Hütte. Our introduction to “watch your step” hiking. 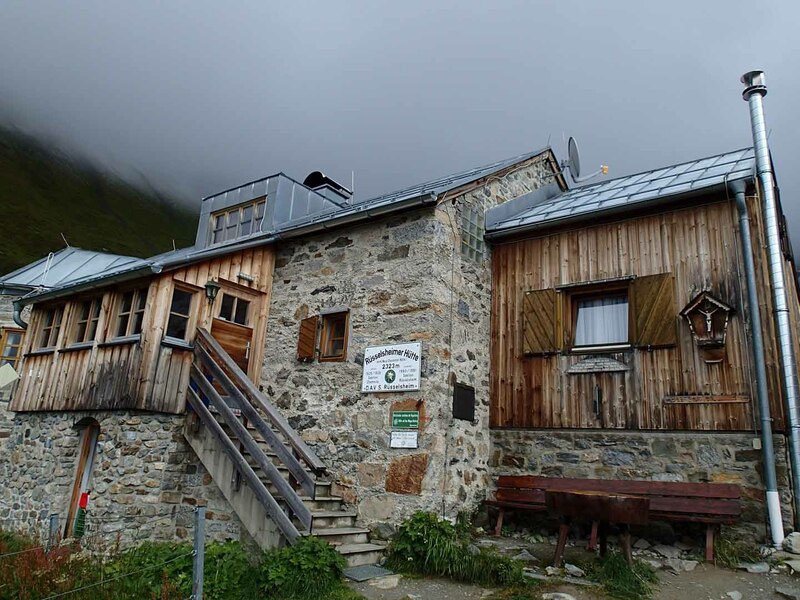 Two and a half hours later, we arrived at the Rüsselsheimer Hütte, greeted by low hanging clouds. View down to Pitztal from Rüsselsheimer Hütte. After lunch, we hiked further up from Rüsselsheimer Hütte to Gahwinden (1 hour up) for the view. And what a view it was. 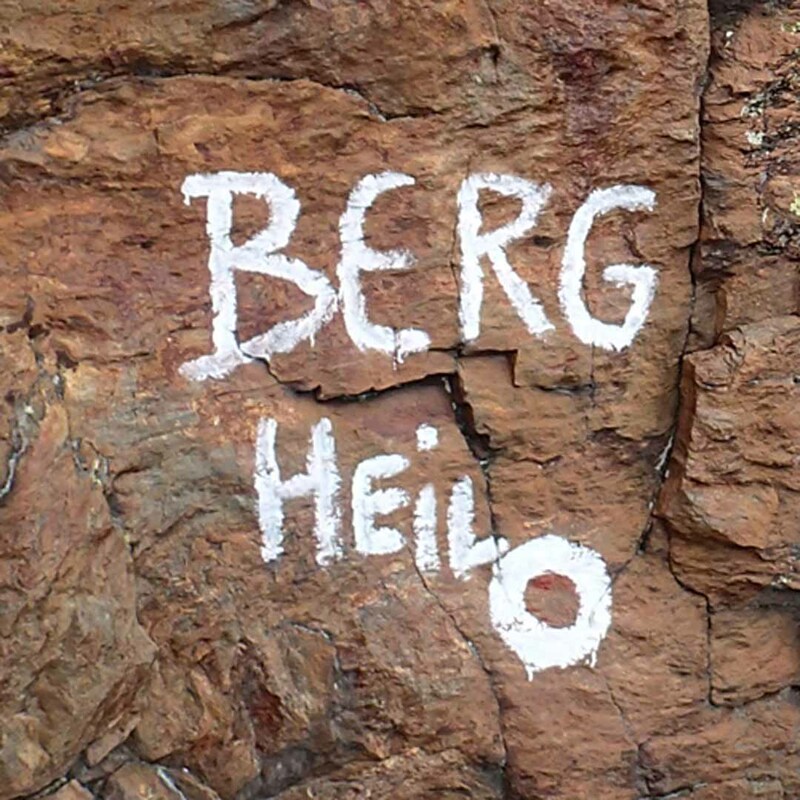 We also saw Steinböcke. Rüsselsheimer Hütte and Pitztal as seen en route to Gawinden. We spent the night at Rüsselsheimer Hütte. Day 2: It was still raining on and off on our second day, so after hiking back down to Plangeroß we decided to hike to Taschachhaus (2.432 m : 7,979’) via the low-lying Tachachbach trail #924 (2:30 hours). This, too, was a good decision because the alternative path–the Fuldaer Höhenweg–involves some cable work along steep, cliffy, terrain. Better to wait a day with hopes of drier weather. 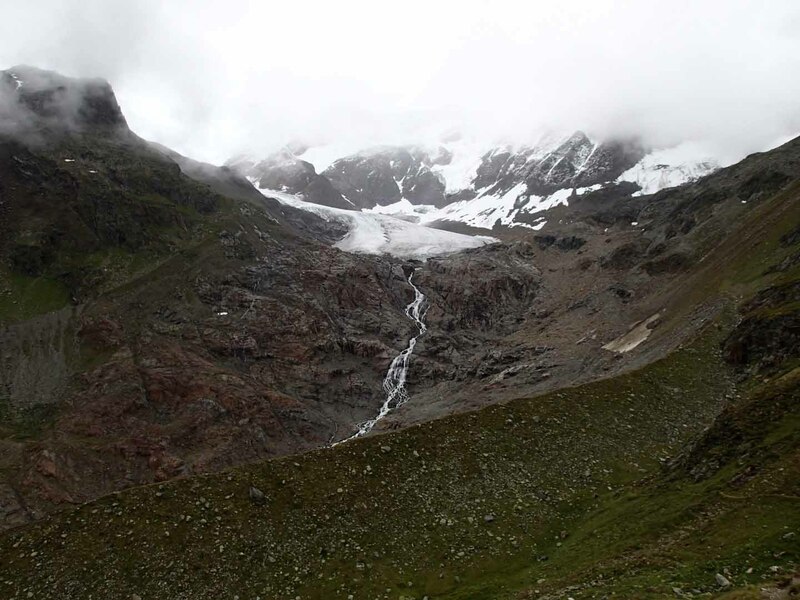 The trail up the valley follows the path of a long receded glacier, the Taschachferner. 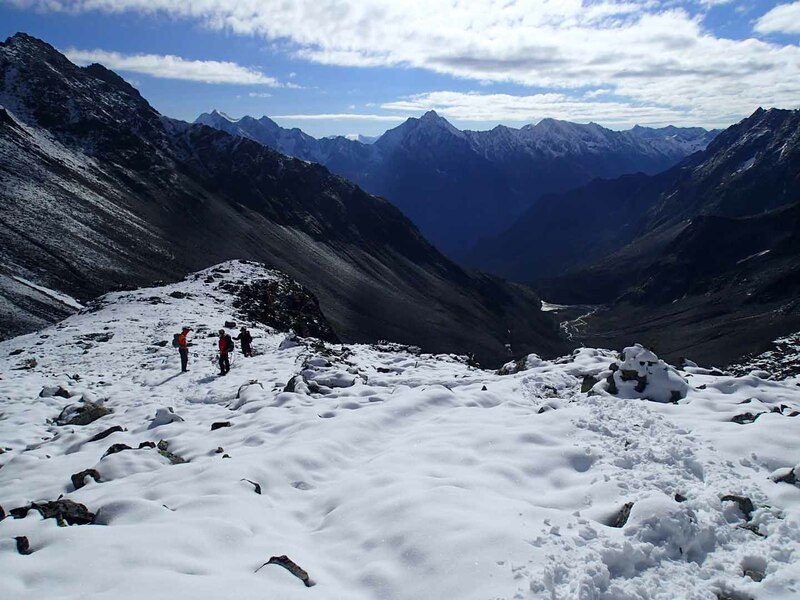 As one nears the end, there is the opportunity to hike up a steep moraine to reach the hut. Along the way, we stopped for lunch at Taschachalm. We spent the night at Taschachhaus. Day 3: The next morning, we awoke to some sunshine peaking through the clouds as we hiked from Taschachhaus to Riffelsee via the Fuldaer Höhenweg (2.432 m : 7,979’, 3:00 hours). View back to Taschachhaus along Fuldaer Höhenweg. Taschachhaus and Taschachferner as seen from Fuldaer Höhenweg. 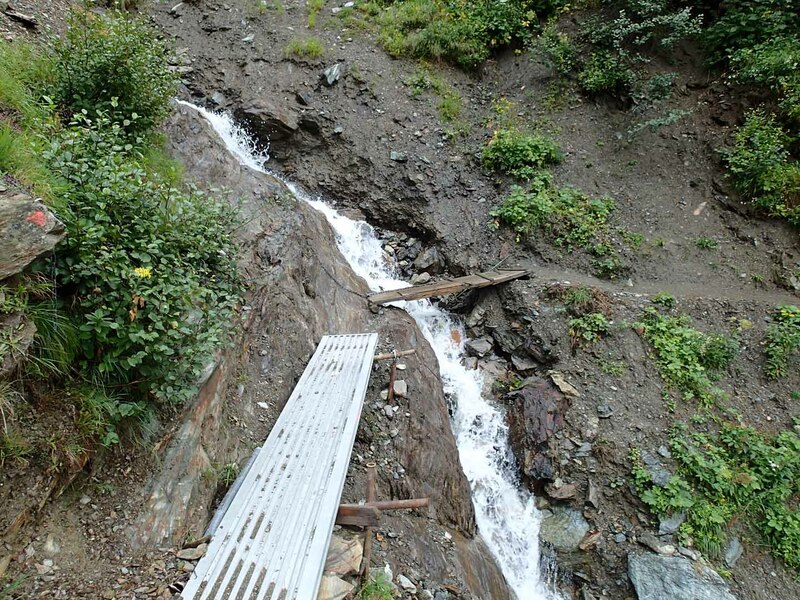 One of the more engaging sections of the Fuldaer Höhenweg. 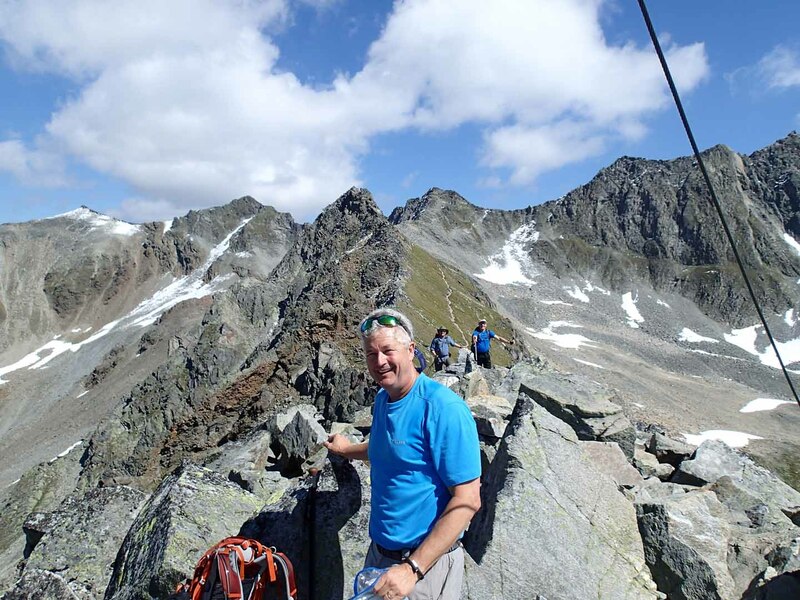 We enjoyed lunch at the Riffelsee Hütte and then took the cable car down to Mandarfen. 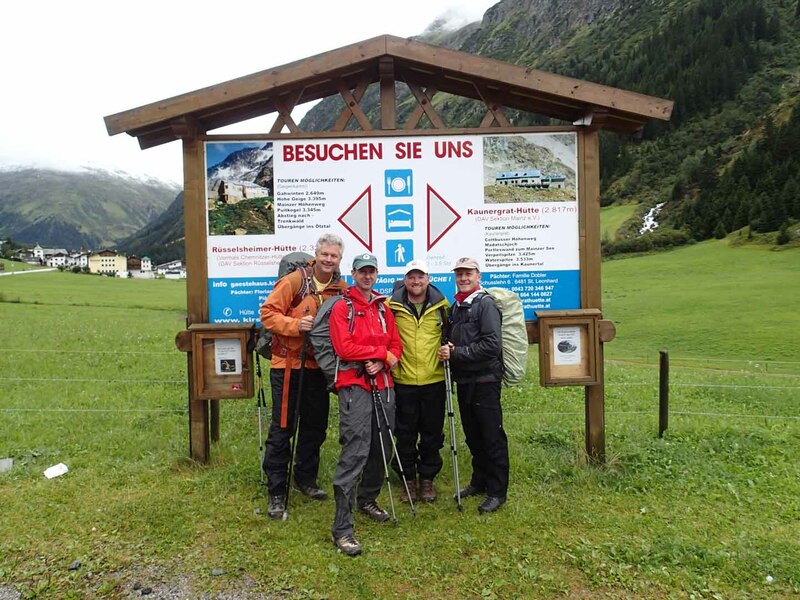 We next attempted to hike up to Braunschweiger Hütte, where we had originally planned to stay 2 nights, but again we aborted this hike after an hour of driving rain and reports of hail and snow above. Instead, we enjoyed luxury at the Hotel Wildspitze in Mandarfen. We plotted our next day, while enjoying dinner, a few beers and some schnapps. 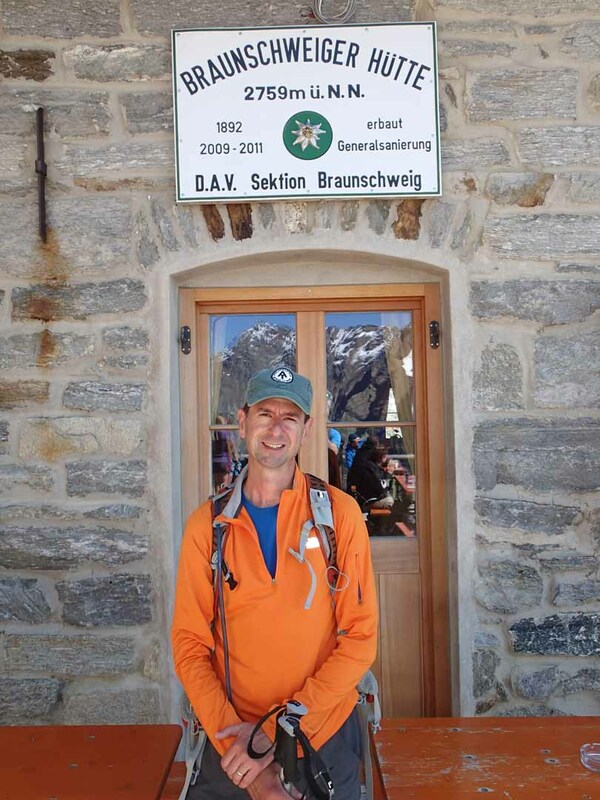 A call to the Kaunergrathütte confirmed room availability and a two day window of great weather. 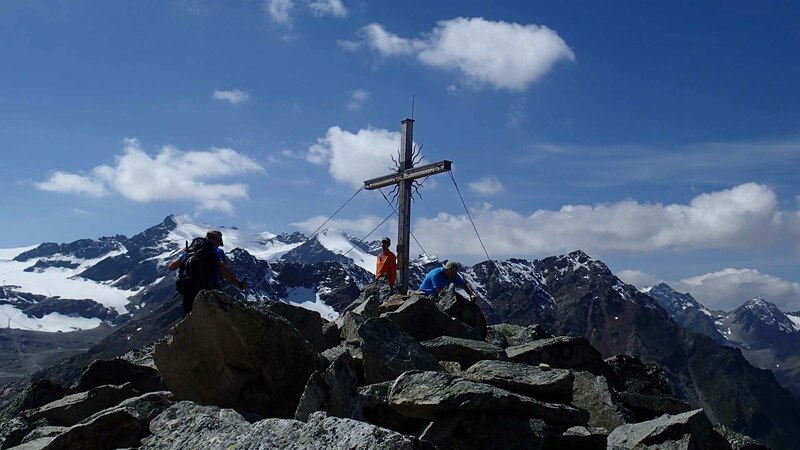 Since the Kaunergrathütte is the highest situated hut in Pitztal, good weather was essential. We booked it. Day 4: The forecast was for clearing skies as the day progressed. Since we needed about four hours to hike up to the hut, we decided to start the hike up around noon. So, in the morning, we drove out of the valley and into Imst in search of elusive alpine hats to buy. There were none in Pitztal. We searched and searched and almost gave up. 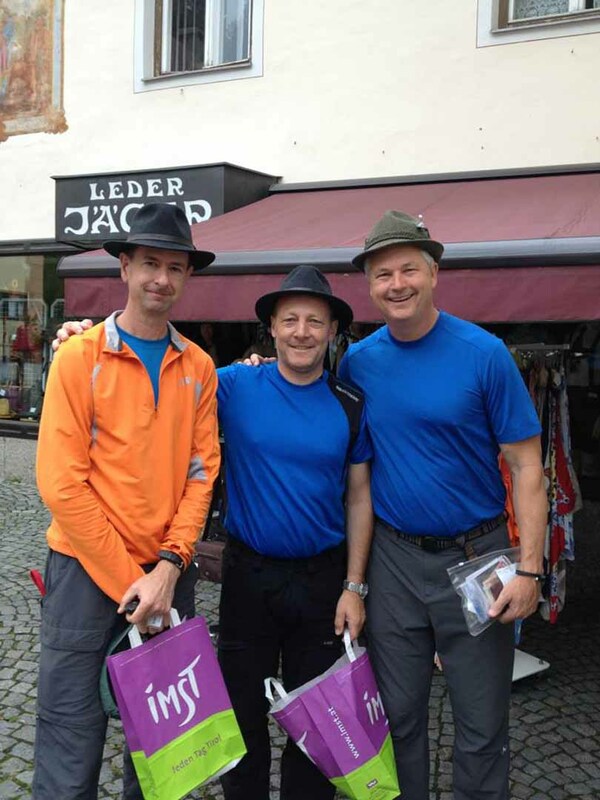 Finally, we came across Leder Jäger, a small shop in Imst that was open and had hats. 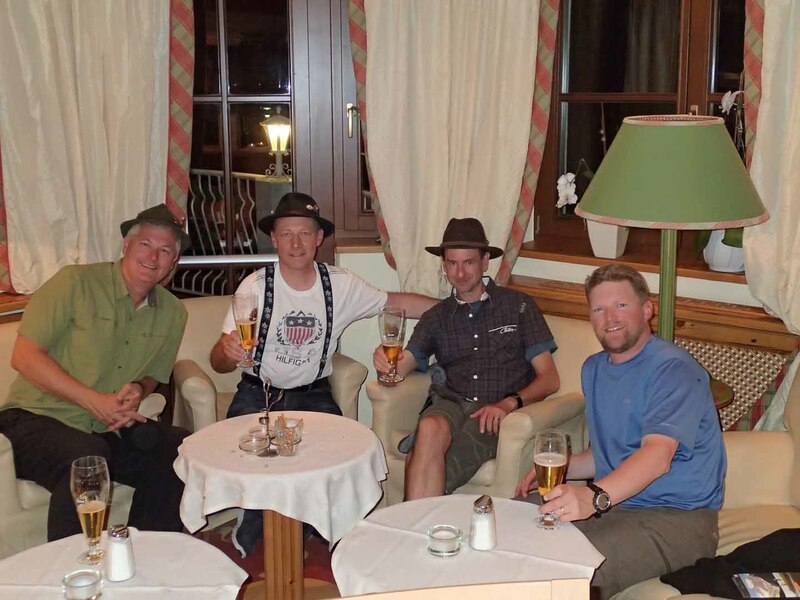 With our newly acquired hats, in Imst. Looking sufficiently silly, we drove back to Plangeroß in Pitztal to begin our trek to the Kaunergrathütte, (2.817 m : 9,242’) (3:45 hours). 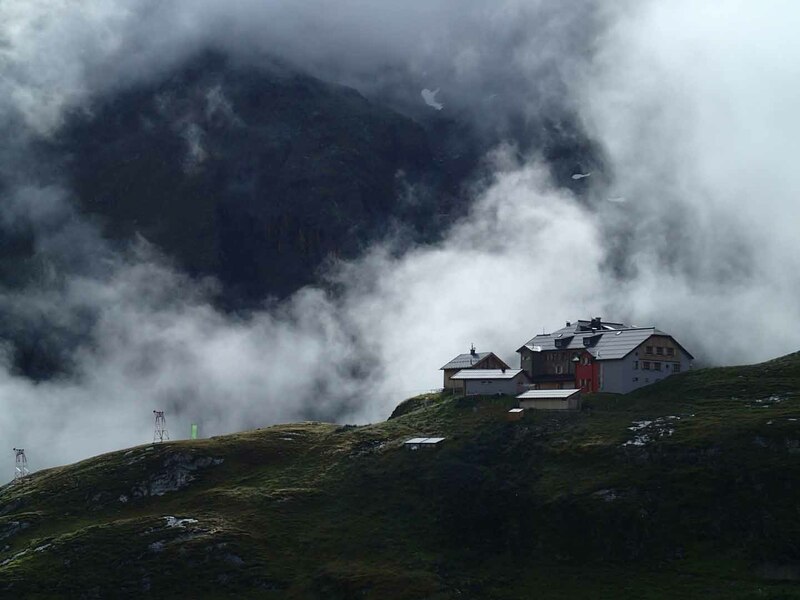 We spent the night at the Kaunergrathütte. Let me just pause a moment here and share that the Kaunergrathütte was, by far, our favorite hut. The proprietor, Julia and her family Dobler were very friendly and made us feel especially welcome while we were there. 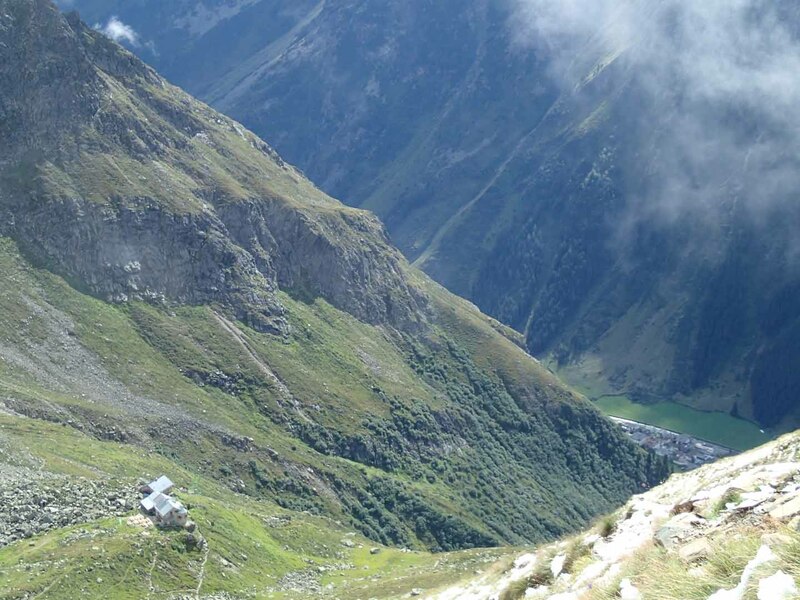 And the hut itself is situated in a perfect location at the foot of the majestic Watzespitze. Alpenglow on the Watzespitze and Kaunergrat. 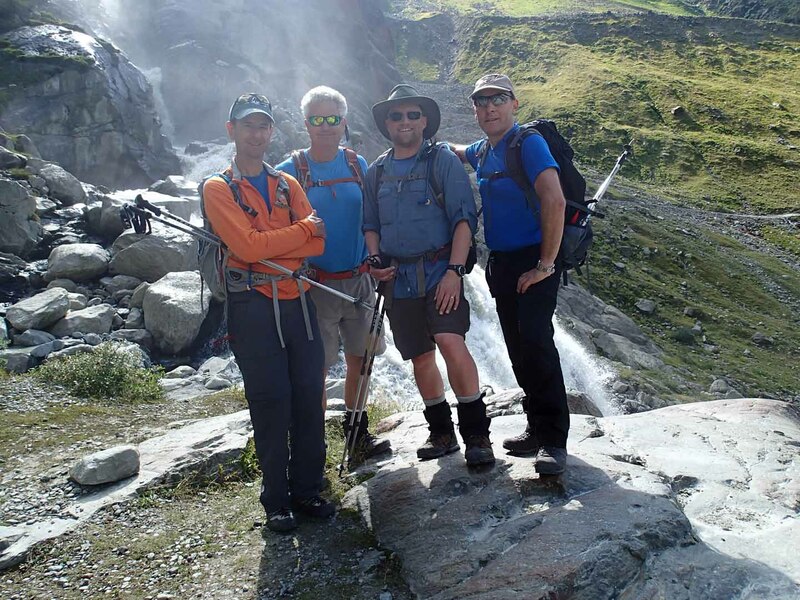 Day 5: We awoke to perfect weather and after a leisurely breakfast, we began the first of two hikes up high in the environs of the Kaunergrathütte. Day hike from hut to Plangeroßkopf & back to hut. 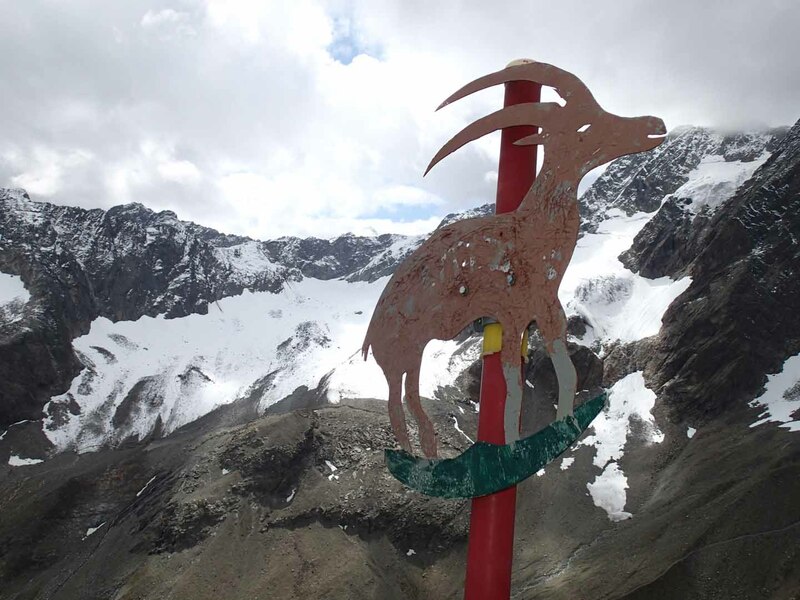 Plangeroßkopf, at 3,053 m (10,016′), offers a 360 degree panorama of the surrounding mountains of the Kaunergrat range and down into Pitztal. There was new snow over much of the hike, so it was very slow going, breaking trail and ensuring adequate footing. But it was well worth the effort as the views gained were among the best of our trip. After refueling with lunch back at the hut, we set out again for a hike up to Steinbockjoch. Another cable section along the way down from Steinbockjoch. 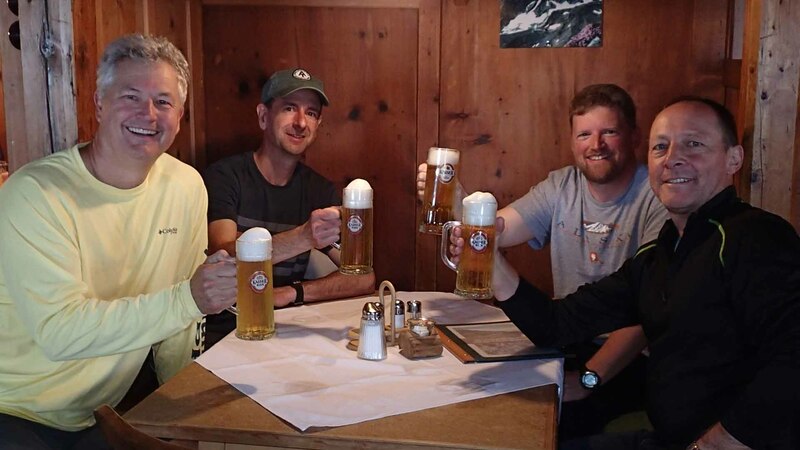 After our exciting day hikes, we relaxed and spend our second night at the Kaunergrathütte. 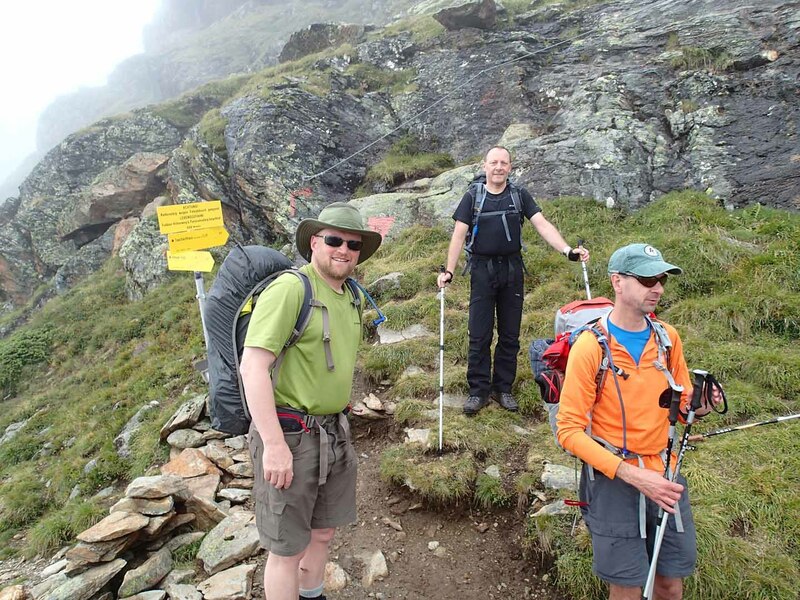 Day 6: The next morning, we bid a fond farewell to the good people of the Kaunergrathütte as we set off to Riffelsee via the Cottbuser Höhenweg (4:30 hours). Geigenkamm panorama along the Cottbuser Höhenweg. This hike required one to focus as there were several cable and ladder sections along steep cliffs. Despite the challenge, the view to effort ratio was one of the best I’ve experienced. After lunch at Riffelsee Hütte, we hiked down to Mandarfen (1:30) in the valley. I took the bus back to get our car in Plangeroß. We spent the night at the Hotel Sportiv-Hotel Mittagskogel in Mandarfen. Planning our Braunschweiger Hütte ascent at the Hotel Wildspitze. 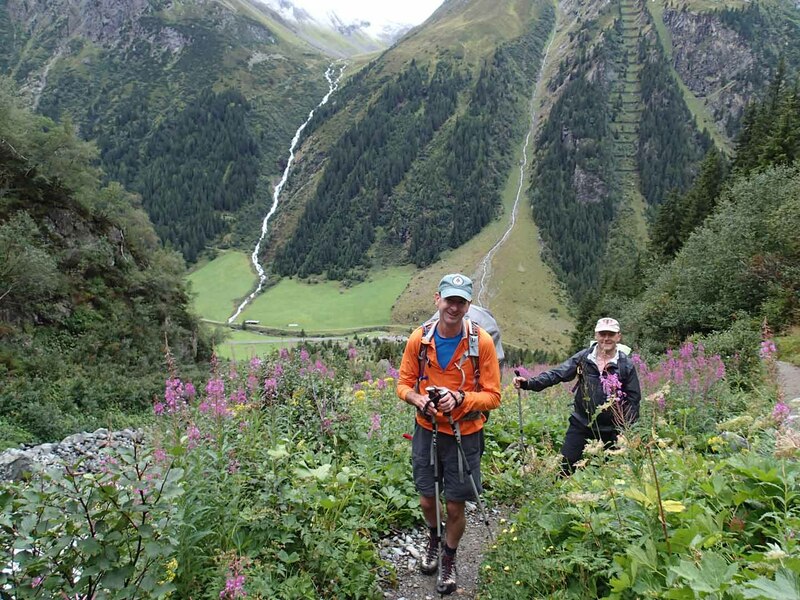 Day 7: Our final day of hiking began at the end of the valley, in Mittelberg. 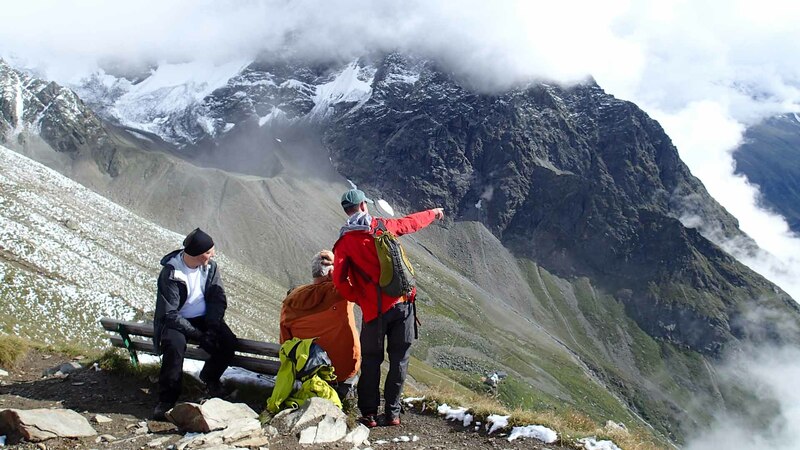 From there, we took the Pitztaler Gletscherexpress and then Wildspitzebahn to Café 3,440 for a view of the Wildspitze. We then took the cable car back down to the termination point of the Pitztaler Gletscherexpress. 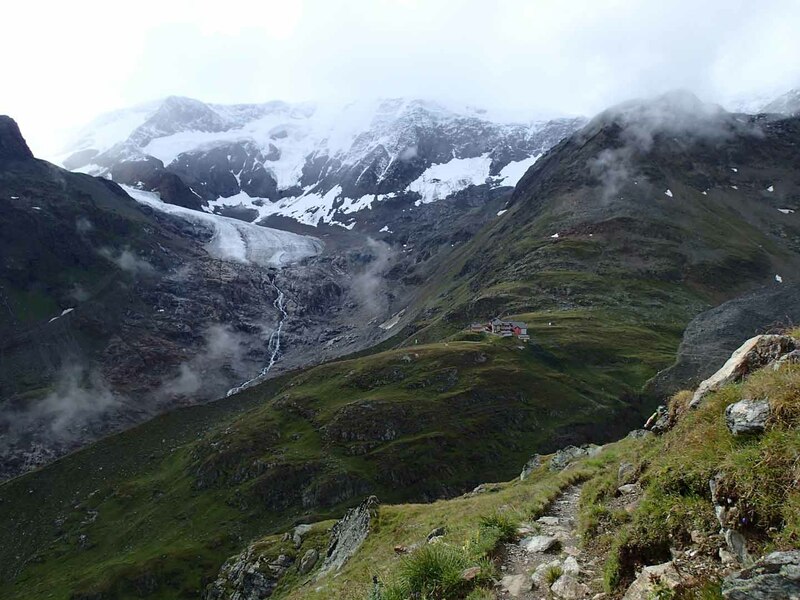 From there, we hiked to the Braunschweiger Hütte (2:00 hours) over the Mittelberg Glacier. Ben on the Mittelberg Glacier. 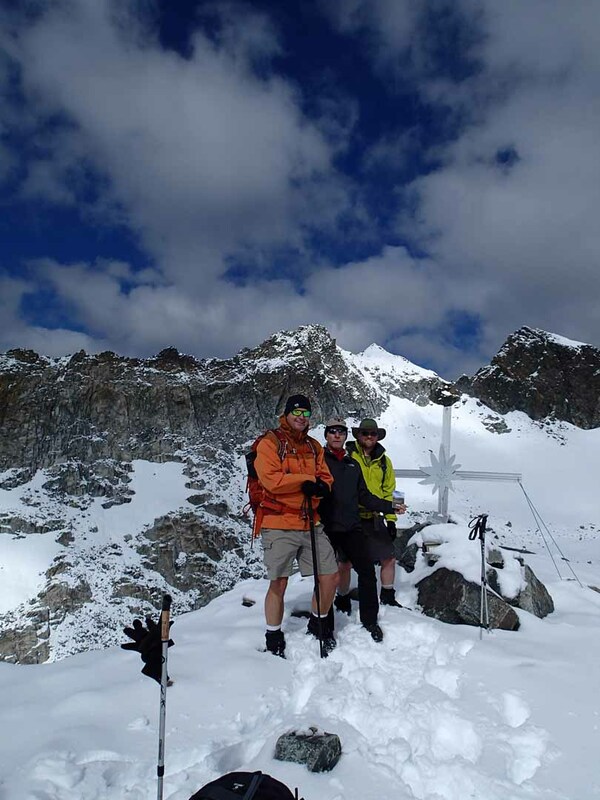 Gerd, Gregg and Albert on the Mittelberg Glacier. Braunschweiger Hütte in the background. 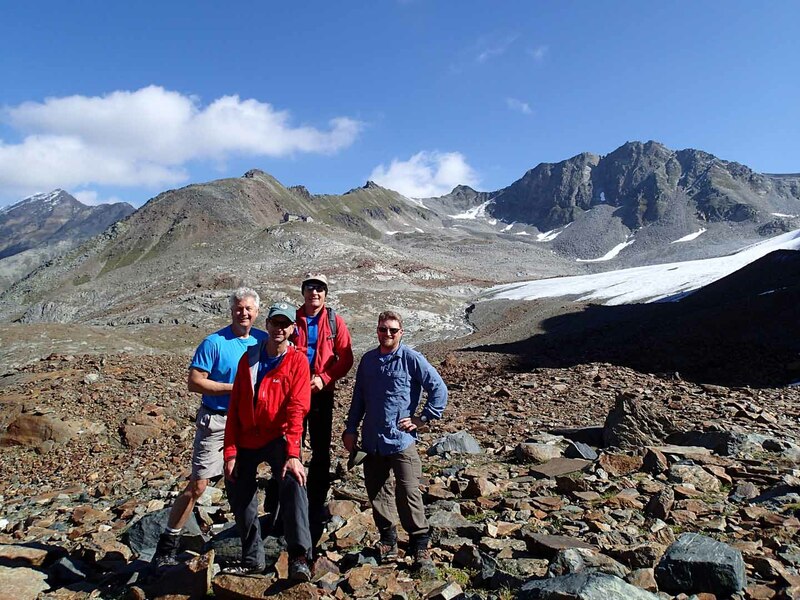 Our intrepid crew with Braunschweiger Hütte in background. 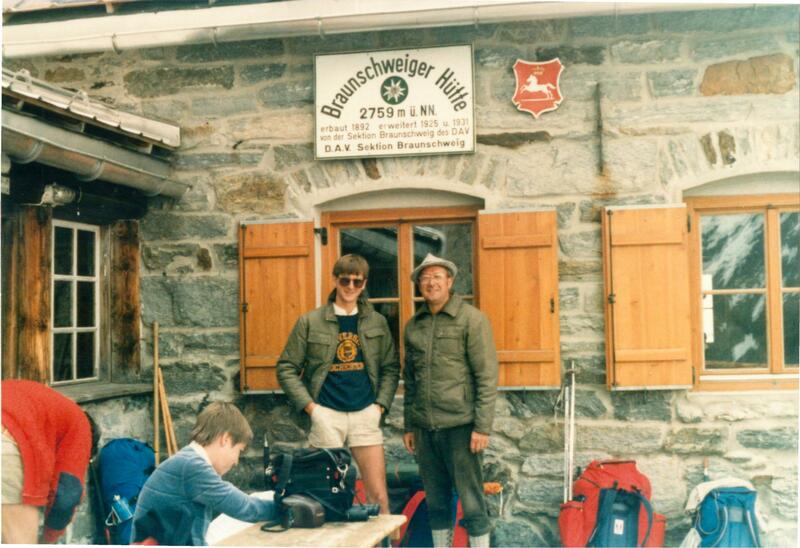 Me at Braunschweiger Hütte, July 1984. After eating lunch and reminiscing about my last visit to the Braunschweiger Hütte in 1984, we hiked part way up to Pitztaler Jöchl. 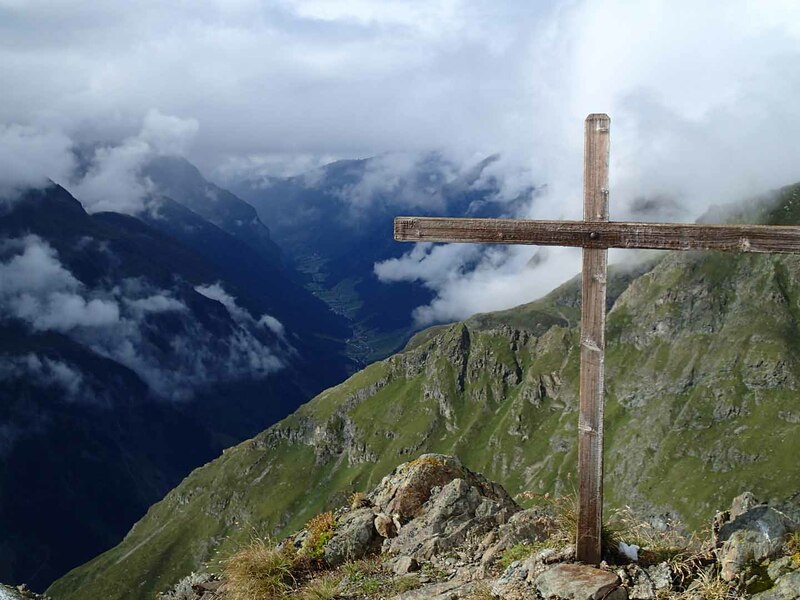 But time was no longer on our side, so we turned back and instead summited Karleskopf, (2,902 m). 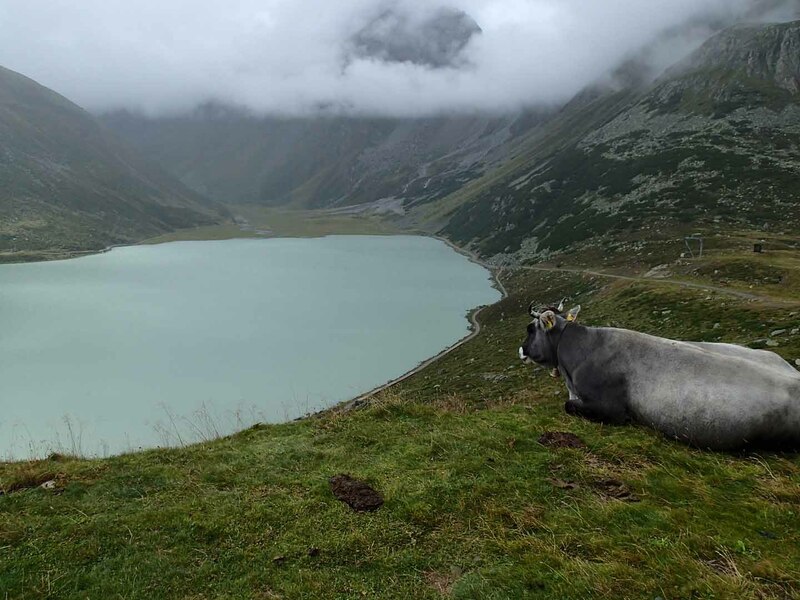 I had hoped on this trip to spend time hiking on the Mainzer Höhenweg, but weather and time did not permit. Perhaps I’ll have another chance on a future visit. 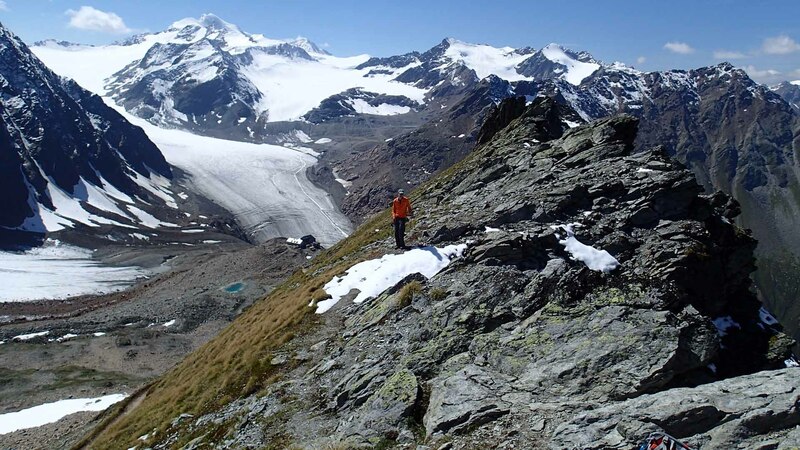 In the vicinity of Pitztaler Jochl. Braunschweiger Hütte below. 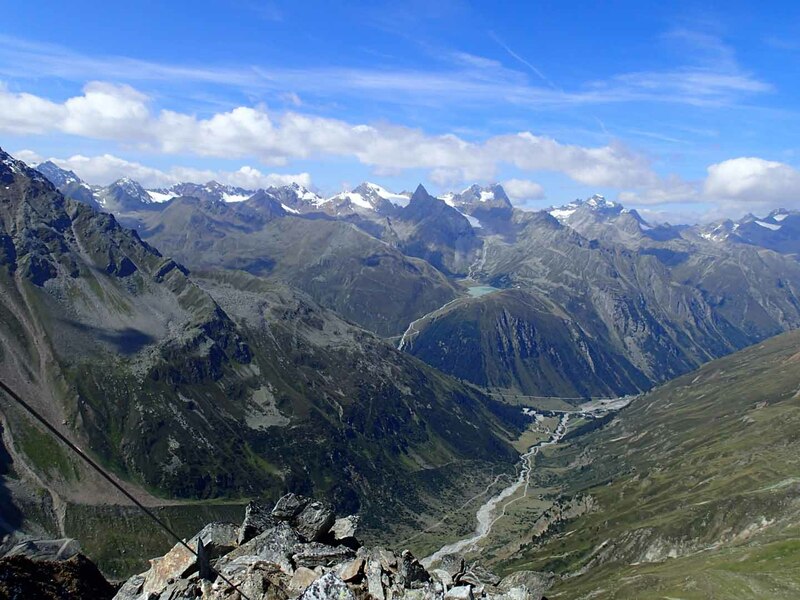 View from Karleskopf down to Pitztal. Riffelsee in background. After drinking in the views, intoxicated, we hiked back down to Mittelberg via the waterfall trail. Final crew shot on waterfall trail down to Mittelberg. Again, we spent the night at the Hotel Sportiv-Hotel Mittagskogel in Mandarfen before driving back to Landstuhl the next day. Here is a map showing the location of the huts we visited on our trip. 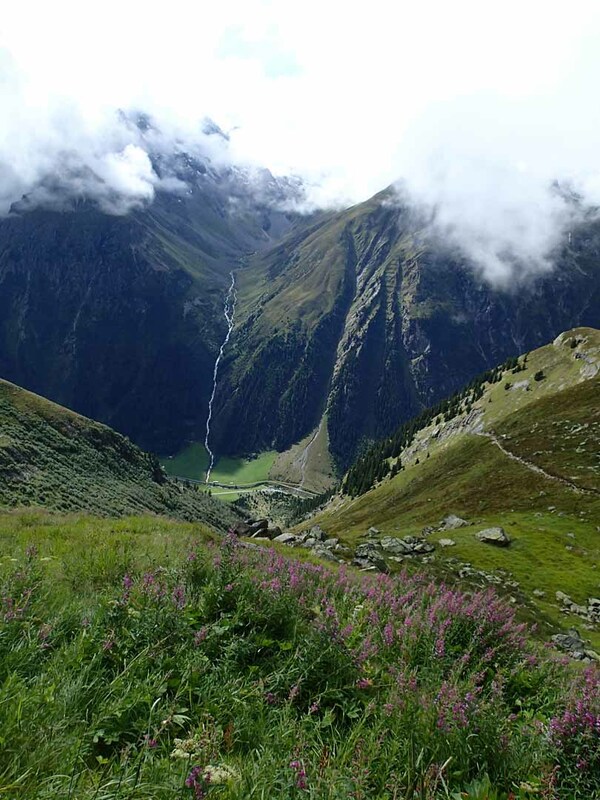 The location of the huts we visited in Pitztal. If this post wasn’t long enough for you and you somehow feel cheated not having had the opportunity to see all the pictures to get the fullest sense of the fun we had, then I invite you to spend the next hour and forty minutes of your life watching this movie. Again, I recommend full screen and High Definition. This entry was posted in Backpacking, hiking, Travel and tagged Austria, Backpacking, Braunschweiger Hütte, Burg Nanstein, Cottbuser Höhenweg, Geigenkamm, Germany, Hiking, Hut to Hut, Kaunergrat, Kaunergrathütte, Landstuhl, Pitztal, Plangeroßkopf, Rüsselsheimer Hütte, Riffelsee Hütte, Steinbockjoch, Taschachhaus, Tirol, Travel, Wildspitze. Bookmark the permalink. 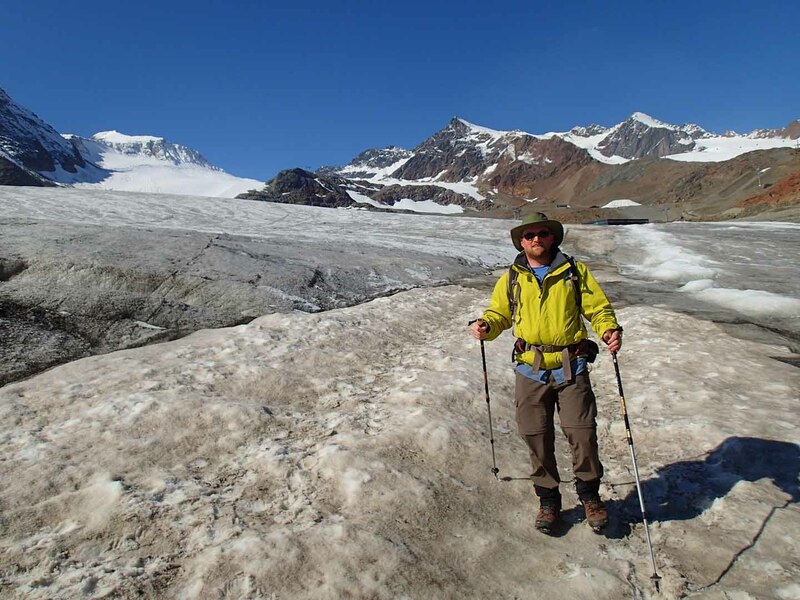 Hi Albert, my boyfriend and I are currently planning a hut to hut hiking trip in Austria and while searching the internet I came across your super informative blog. After reading the story and seeing pics and video of your trip, we are very interested in following your footsteps and doing something very similar this August. Could you please advise us on how to make reservations at individual huts or if reservations are needed? Also, do you have any idea about the current prices? Thank you! Day 1: From Plangeross, hike up to Rüsselsheimer Hütte (2:30 hours). After lunch, hike from Rüsselsheimer Hütte to Gahwinden (1 Hr) for the view. Overnight at Rüsselsheimer Hütte. Day 2: Hike the Mainzer Höhenweg from Rüsselsheimer Hütte to Braunschweiger Hütte (8 -10:00 hrs) (google: ViaAlpina: Mainzer Höhenweg). This is a Black route tour with the option to overnight at the approx. half-way point Rheinland-Pfalz-Biwak. You must reserve sleeping here through the Rüsselsheimer Hütte or Braunschweiger Hütte. 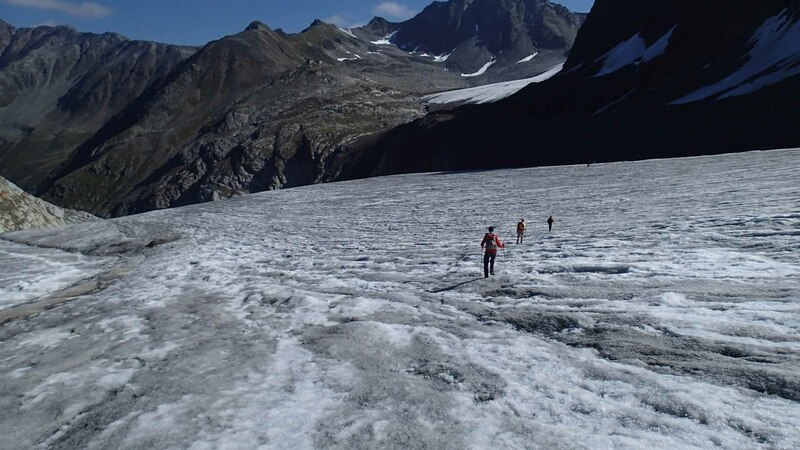 You also need to bring food, crampons and ice axe. If this is too much, or weather is bad, hike back down from Rüsselsheimer Hütte bus down the valley and hike up to Braunschweiger Hütte. Day 2 or 3: Continue on the Mainzer Höhenweg to Braunschweiger Hütte. Overnight at Braunschweiger Hütte. 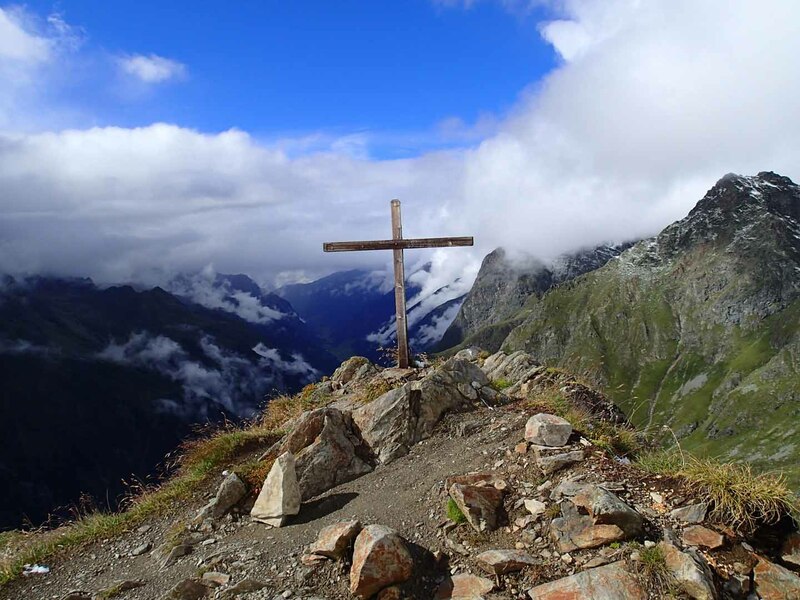 Day 3 or 4: From Braunschweiger Hütte, you can a) hike down to Mittelberg and then hike up to Taschachhaus via Tachachbach trail 924 (2:30 hours). Lunch at Taschachalm. 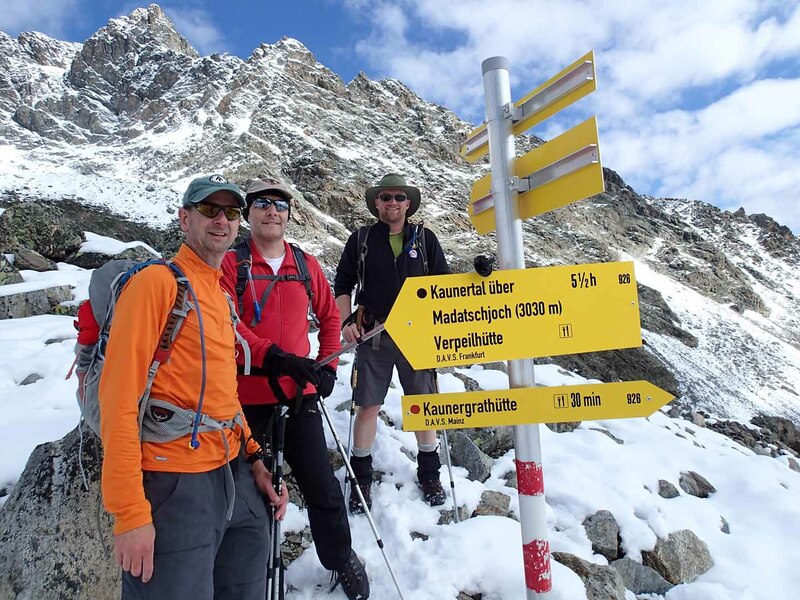 Or b) engage a guide and spend a 10-12 hour day summiting the Wildspitze and the come down to Taschachhaus. Either way, you would then overnight at Taschachhaus. 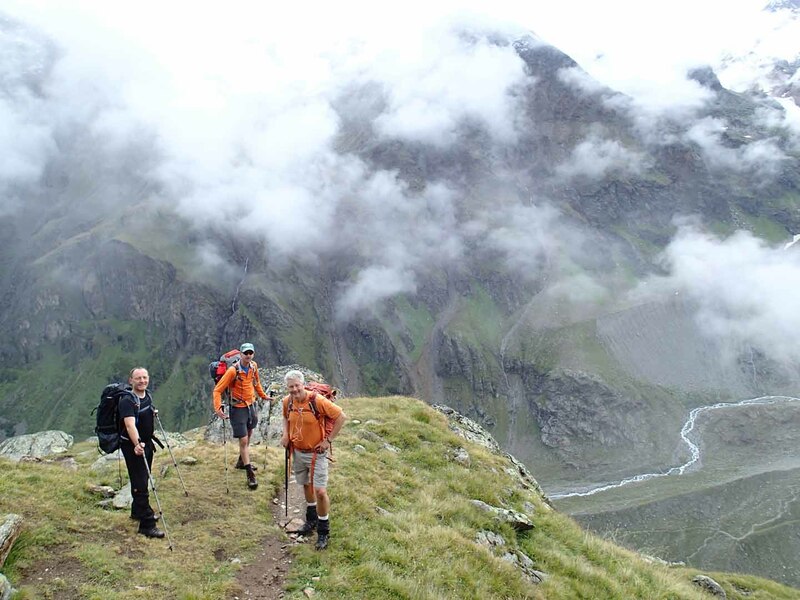 Day 4 or 5: Hike from to Taschachhaus to Riffelsee via Fuldaer Höhenweg (3:00 hours). Lunch and overnight at Riffelsee Hütte. 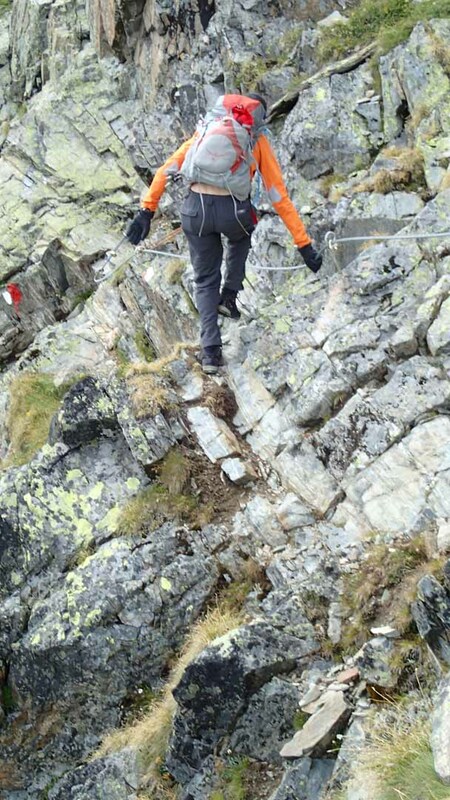 Day 5 or 6: Hike to Kaunergrathütte via the Cottbuser Höhenweg (Black, 4:30 hours). Overnight at Kaunergrathütte. 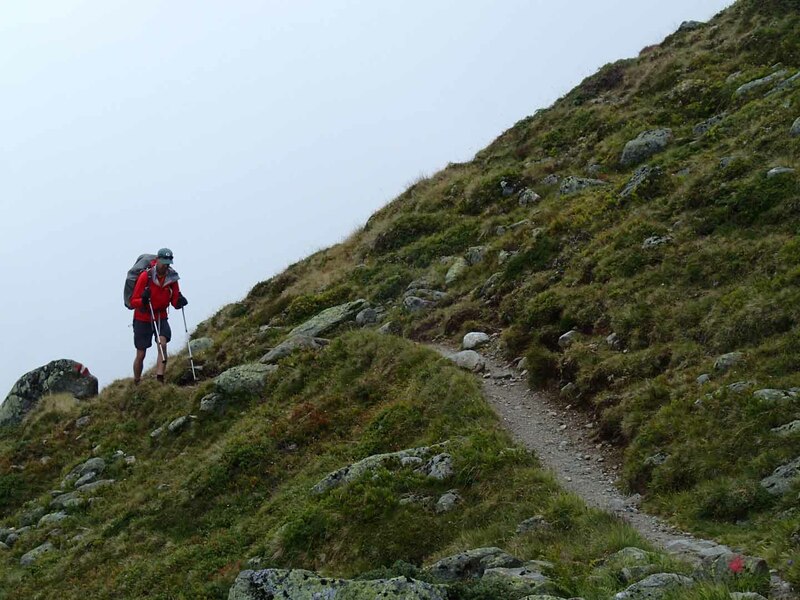 Day 6 or 7: From Kaunergrathütte, hike back down to car in Plangeross (3:30 hours). Overnight in a hotel in Pitztal. Good luck and please come back and let me know how it went! Albert, I just wanted to let you know how much I enjoyed your blog, to the point that I called Gregg to see if he had a DVD of the trip that I could see. You did an awesome job with the pictures and description of the trip. I really look forward to seeing the DVD. Sharon, that’s very nice of you to say. Glad you enjoyed it–we sure did. But be careful what you wish for: the DVD/BluRay is 1 hour 40 minutes long. It’s the same as the YouTube video at the end of this post.